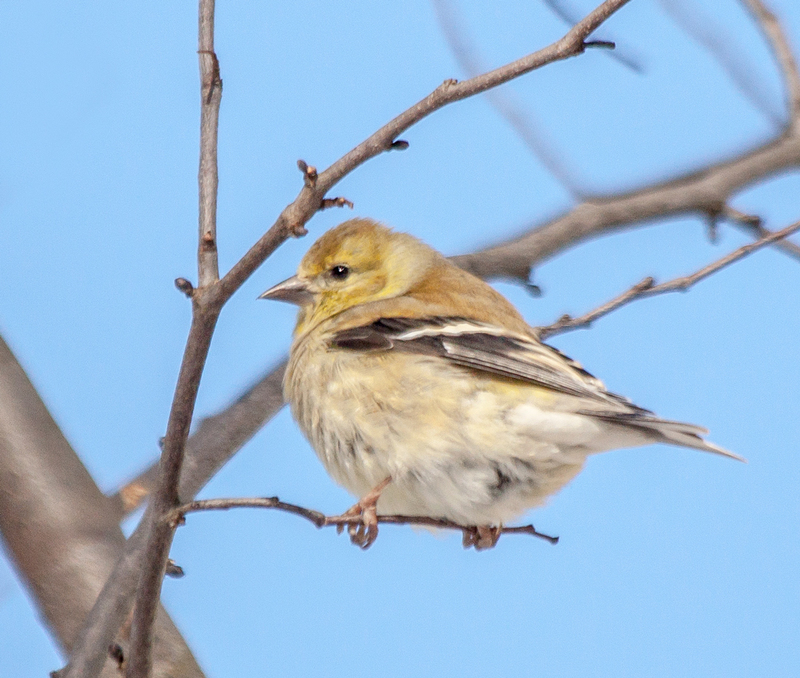 Another unexpected bird that I sighted during a recent walk around my neighborhood was this American Goldfinch (Spinus tristis). I don’t think that I have seen one before during the winter—during the spring and the summer the goldfinch’s bright yellow plumage makes it easier to spot one. I guess I need to pay more attention to the birds of the neighborhood, for it appears that more of them overwinter than I originally thought. What else is out there, waiting to be seen and photographed? 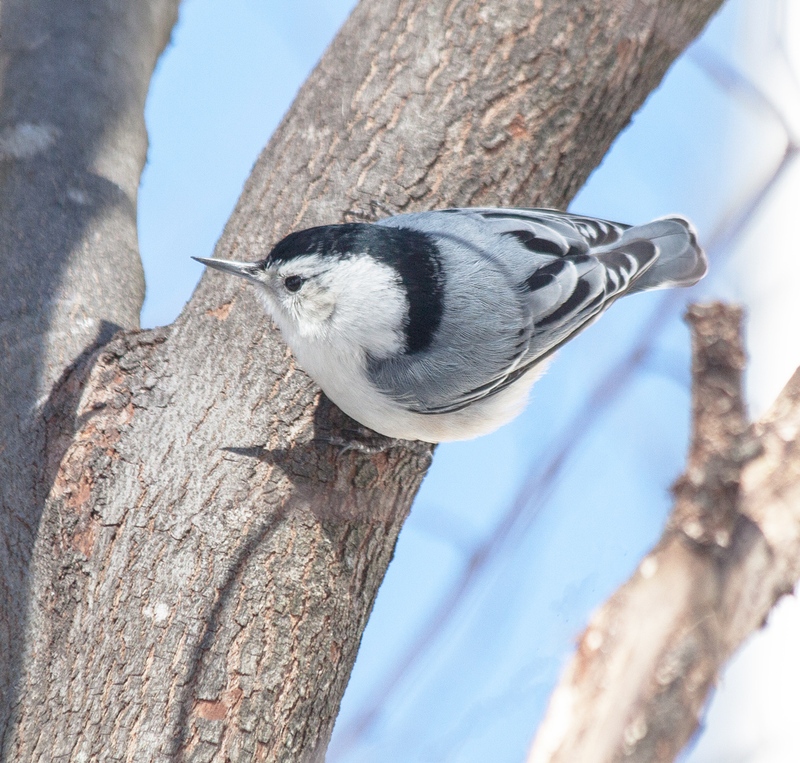 I didn’t think that there were many birds in my suburban neighborhood at this time of the year, so I was pleasantly surprised to see a number of different species during a post-snowstorm walk, including this White-breasted Nuthatch (Sitta carolinensis). For most of hte time that I was observing it, the nuthatch was in the typical head-down position, but it finally turned its head to the side and I got this shot. How do you convey a sense of the winter season? Do you take wide-angle shots of snow-covered mountain peaks? Do you show vast fields or forests or frozen ponds, all blanketed in white? I didn’t really have a plan when I set out for a walk in my neighborhood after a recent storm that dumped over six inches of snow (about 15 cm) on us. The sun was shining and the snow was beautiful, though it was windy and cold. 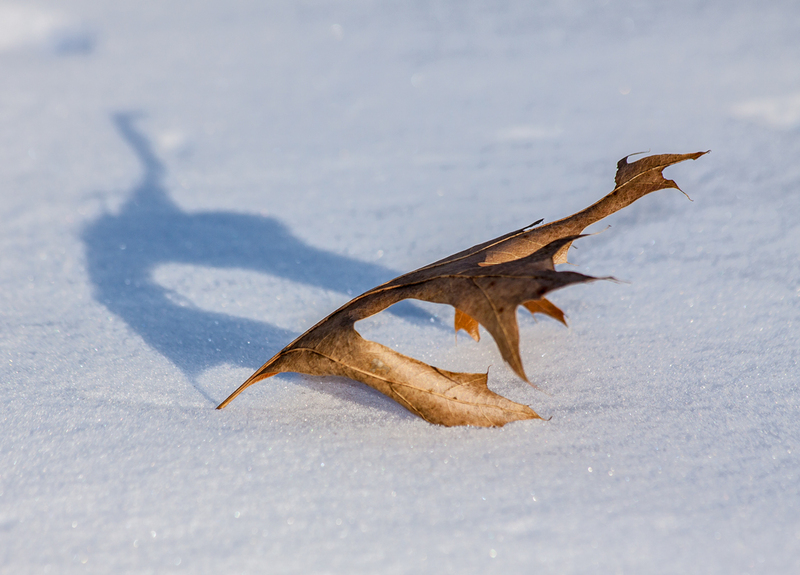 I walked for a while, taking in this uncommon view of the common scenery (we don’t get snow very often in Northern Virginia), when I caught sight of some motion out of the corner of my eye—an oak leaf was dancing across the surface of the powdery snow. When the leaf came to rest, I hurried toward it, wanting to capture the simple beauty of this winter still life that conveyed to me a sense of the winter season. 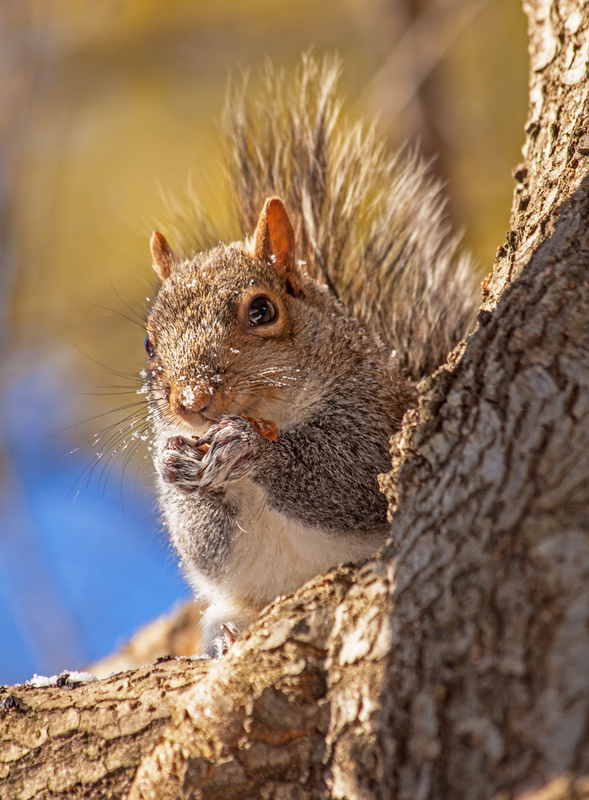 Despite the frigid cold and snow, the squirrels in my neighborhood are out and active (and looking surprisingly cute). 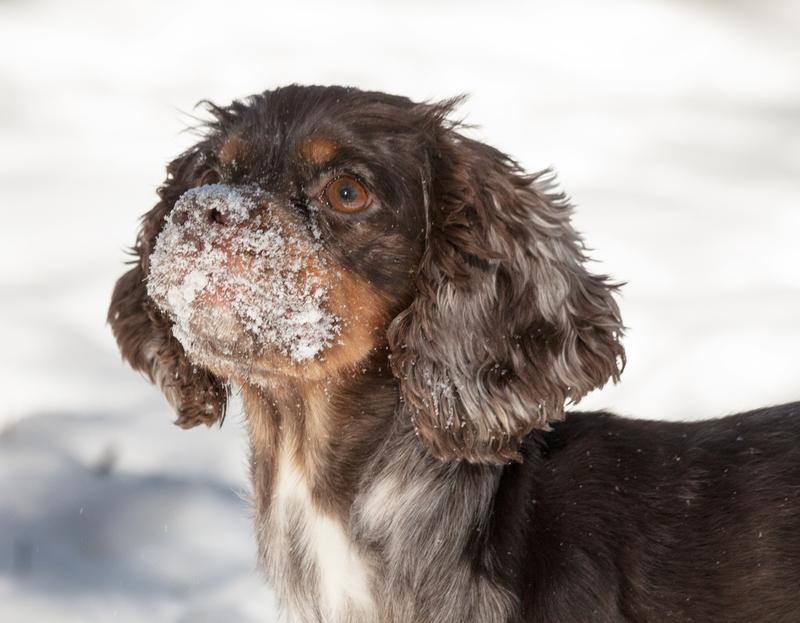 Little kids get pretty excited about snow, but it’s hard to match the enthusiasm of a puppy as she propels herself face-first into the freshly fallen snow. 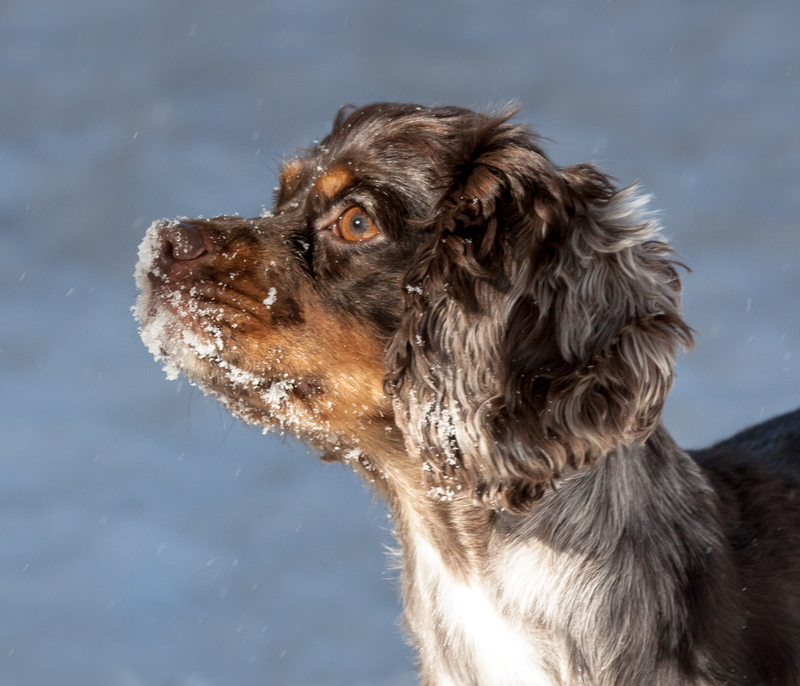 These shots show Freckles, a year-old Cocker Spaniel, a few seconds after she dove into the snow in my backyard. The yard had areas of sunshine and shadows and the snow appears white when Freckles was in the sun, as in the first image. The snow took on a bluish cast however, when the snow in the background was in the shadows. I liked the effect and cropped the second image to make the background more uniform, causing it to look a bit like a formal studio shot. Northern Cardinals (Cardinalis cardinalis) are one of my favorite birds, in part because they stay with us throughout the winter. 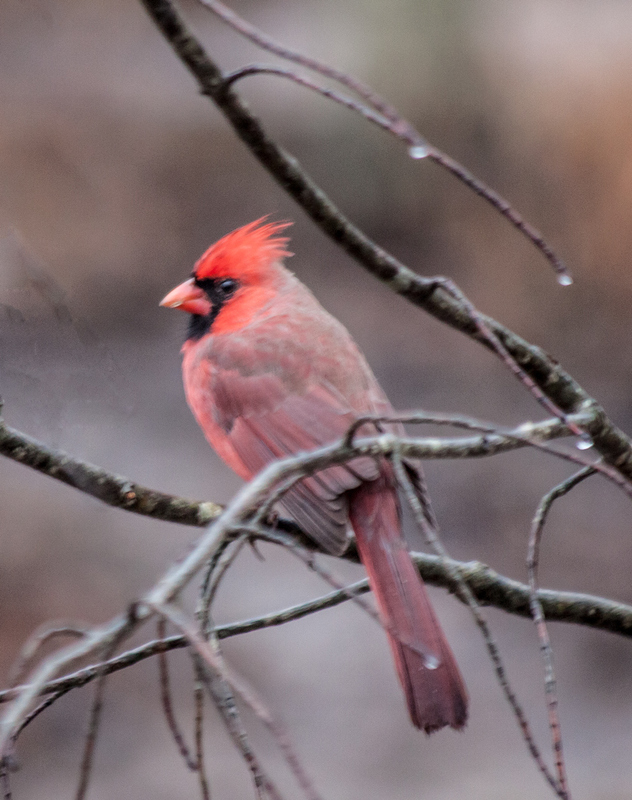 The bright red color of the male cardinal never fails to lift my spirits, even on a dreary, rainy day in mid-December, when I took this photo. The feathers on the bird’s body seem to be more subdued than usual, but the spiky red feathers on the cardinal’s head give it plenty of color as well as attitude. We are covered in snow, thanks to yesterday’s daylong snowstorm, and I would love to get some shots of a cardinal in the snow. The bitterly cold temperatures (it’s 9 degrees F (minus 13 C) and windy right now), gusty winds, and treacherous road conditions, however, may limit my photo opportunities for the next few days. Yesterday when the sun was shining and the temperature soared to the high 50’s (15 degrees C), I was blissfully ignorant that snow was headed our way. 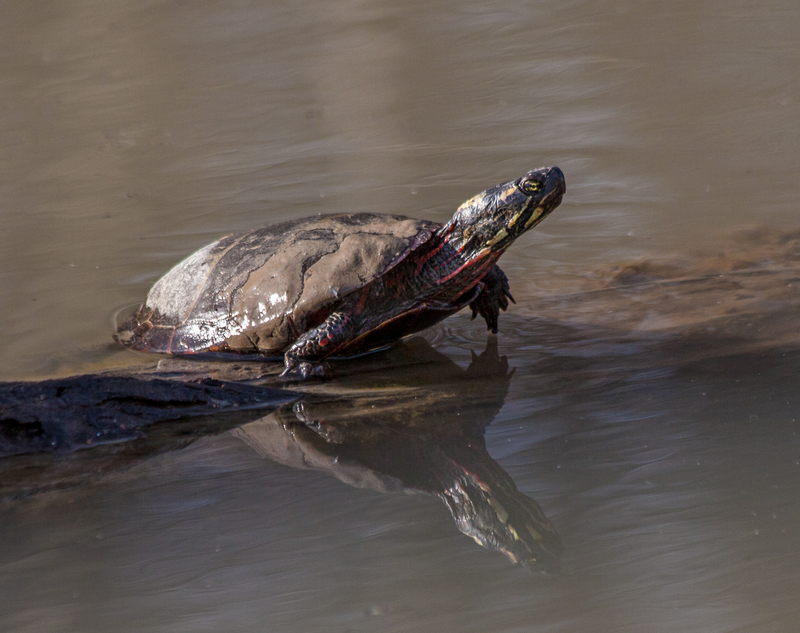 Like this Eastern Painted Turtle (Chrysemys picta picta) that I observed at my local marsh, I wanted only to bask in the warmth of the sun. Today in the Washington D.C. area, the federal government and most of the schools are closed and we are all hunkered down as we await the arrival of what is forecast to be the biggest snowstorm we’ve had in a few years, as much as eight inches (20cm). During the summer, I often see a whole row of turtles on this particular log, but yesterday this was the only turtle that had bee roused from its slumbering state by the surprisingly warm, sunny weather. The mud on its shell suggests that this turtle did not swim around a lot, but made a beeline for this log after rose to the surface. I suspect that this turtle is already back in the mud at the bottom of the pond today, comfortably dreaming of spring, when it will reemerge into the sun. Click on the photo to see a higher resolution view of the turtle.